Last week events demand me to write down some thoughts and hopefully help me to make sense of our current days. To do that nothing better than a couple of long haul flights. After submerging myself from the depth of the web summit that was held in Lisboa-Portugal I could swear that my mind reverse back the aging process by a good lump sum. Let me start my sharing with a note about the advertising world, an industry that I know well from the inside and often referred as a mirror of our society. Being the Web summit one of the most important events of technology, innovation and new business ideas in Europe I had pretty high expectations to hear how the key players are seeing their role and vision for the future. The first surprising note to myself was the fact that only Publicis group (Maurice Levy) and TBWA (Jean-Mary Dru) participated and deliver a couple of key-note presentations at the different conferences (21 to be more precise). Either they were not invited (one possibility) or they don’t understand what it means not to be at the Web Summit. Being in Lisboa was like being in direct contact with everything that matters at the moment and has potential impact in our future as mankind in opposition to my last presence in Cannes Advertising Festival that seemed like a visit to a very, very nice Museum of pictures, videos and sounds. A museum from the past. Oddly enough the Advertising and Design agencies were one of the first industries to step into the digital ecosystem using the first computers, operational systems, e-mails, time sheets and so on, but curiously they were not able to capitalize those early days. The future of (any kind) communication belongs to the people and to what they decide to have inside their mobile phones and tablets, meaning that everything else becomes a nice to have. Movie and video producers, digital born agencies or a myriad of new companies that you cannot label with any specific skill because their core business “it’s just” consumer centric are the new players. Their key skills are mainly two, an alchemy combination of Art + Math. It is a matter of time we will see the big communication holdings ending up with a single brand and a single value proposition to (try to) fight back. Most likely we will see big holdings leveraging on existing (or soon to be acquired) digital services and at the same time milking the cow of traditional advertising until the clients stop paying and disappear. Though dilemma for their shareholders. I mention advertising because it is extremely easy to see it (at least for me), but I could have replaced the word by using, consulting, education, banking or taxis and we would be close to the same results. Last Wednesday morning the main speakers and audience in general had on the top of their minds what had unfolded during the previous night in the other side of the Atlantic, making it clear(if doubts existed) that there are two worlds coexisting in the same planet (at least for now). What worlds are those you might be asking? The voters of Trump vs Clinton? The voters of Brexit vs remain in EU? The welcome of refugees vs the haters of refugees ? The ones committed to minimize the climate change vs the ones that believe it is only a big business scheme ? Should I continue? OK, let’s go a bit further. Gender equality, religion freedom, Corruption, police states, fiscal taxes vs fiscal paradises and the list keeps on growing and growing every day. Whatever opinion you have and whatever “side” you decide to be on the “barricades”, you have to agree with me on one thing, this worlds are drifting apart further and further without any sign of route inflection. Not new, right? You might be asking what can we do to overcome this? How to change what seems to be soon a global deadlock and the beginning of a world order we never seen before? If you believe Donald Trump will be impeached soon, Vladimir Putin will change its foreigner policies or Erdogan will not try to stay in power until is very last human days you can finish your reading here and skip to the last paragraph or purely un-friend me from all social networks, otherwise carry on reading. What we have in front of us it’s our own responsibility and nothing else! The world does not need our complains but solely our actions! Either we commit individually and engage at every level of our life for a better present or we will not have a future to put it mildly. To live is something we cannot delegate or postpone, we have to do it right now and the best way we can, owning fully the consequences of our actions and silences, and let me add, fear it’s not an option. Good news from last week? The conscious of all good people across all nations are starting to wake up and we will see soon more and more transnational movements pushing for a totally different reality. It will be hard? Yes, it will be very hard, but if we want a better world we have no other option, there is no plan B. To wrap up you might be wondering about the 3 waffles in the tittle. 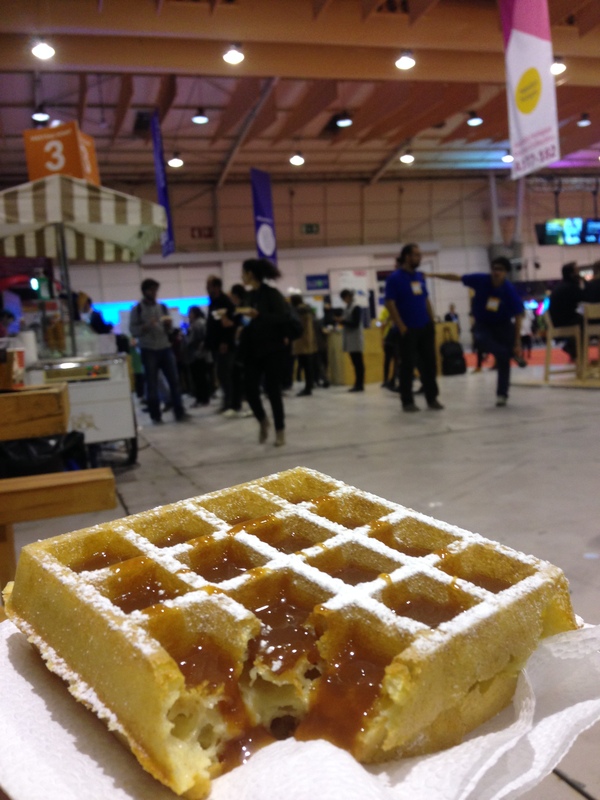 Well for every problem there is virtually a solution, when the energies run low, days (and nights) are long and you have to accept that democracy is indeed the worst political system except for all the others…I found happiness in a little waffle, again and again.